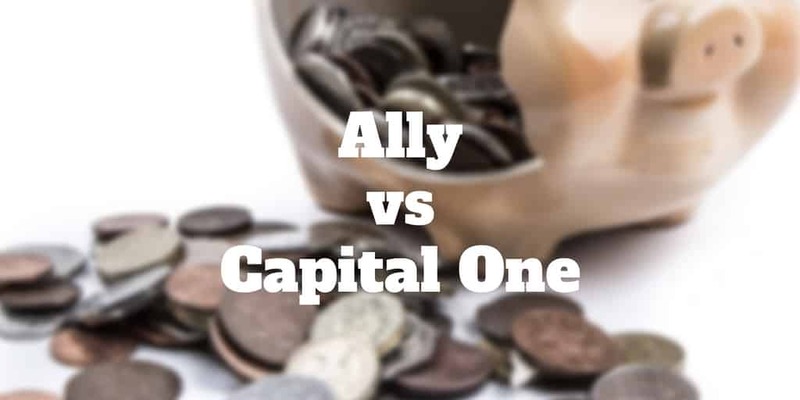 Comparing Ally Bank vs Capital One 360 is no David and Goliath battle. These banks stand toe-to-toe on many key factors from fees to account minimums. While traditional banks often charge hefty fees in order to support the costs of brick-and-mortar branches, the convenience of walk-in locations comes at the price of lower interest savings rates usually. Ally and Capital One 360 are among the crop of innovative online banks who cater to customers satisfied primarily with an online experience only. But savings rates alone aren’t all you need to know when comparing Ally vs Capital One, so let’s dive in to see what else you need to consider. Which Bank Is Better: Ally or Capital One? Ally is famous for its generous savings rates. So, if a high annual percentage yield, or APY, is your biggest concern, you’ll do better there than at Capital One 360. When it comes to fees, Ally shines too. You won’t be stung with monthly fees on checking accounts or savings accounts. And Ally goes so far as to reimburse fees (up to a limit) on out-of-network ATMs. Similarly, Capital One 360 charges no fees for maintaining a checking or savings account. How Much Can You Earn On Savings? Capital One 360 doesn’t offer generous interest rates on savings accounts when compared to Ally but it does come out ahead with higher CD interest rates. So, if you are willing to tie up your money for an extended period, Capital One 360 will be the better bet. Capital One 360 mixes in some benefits of old-school banks too. It is not a 100% online bank because you can walk into a branch and speak with real people if you wish. If the heightened level of customer service is of value to you then Capital One will better meet your needs. While Capital One 360 pays only a nominal amount on balances under $50,000 held in checking accounts, rates rise as high as 1.00% on balances of $100,000 or more. Where Capital One 360 really shines is the rates it pays on longer term certificates of deposit. The 1 and 3-year CD rates offered by Capital One 360 line up closely with the rates paid by Ally but the 5-year rate is the more compelling choice by a margin. Ally doesn’t win too many points for its checking account rate but its savings rate is eye-opening. And if you’re willing to lock up your money for a longer time frame, you will be spoiled for choice because Ally has a range of CDs, including 3-month, 6-month, 9-month, 12-month and 18-month selections as well as the more conventional 3-year and 5-year CDs. Compared to Capital One 360, Ally doesn’t pay out as much on CDs but its generous savings rate will appeal to savers who want quick access to their money. A major difference between Ally Bank and Capital One 360 is the branch network offered by each. Or more specifically, the lack of physical branches in the case of Ally – it is 100% online. Capital One 360, on the other hand, features around 650 branches nationwide. Both Ally and Capital One provide access to tens of thousands of ATMs at no charge. In the case of Capital One, no out-of-network fees apply while Ally commits to reimbursing up to $10 per month for out-of-network domestic ATM fees. And as you might expect from two leading banks, customer support is available around the clock every day of the week. Both Ally and Capital One 360 have customer-friendly fee policies but Capital One enjoys the slight edge. Neither bank charges ongoing fees for holding checking or savings accounts. And neither bank hits with you overdraft protection fees or extended overdraft fees. But Capital One has the more generous policy when it comes to overdrafts. You have 1 full business day to get your bank balance back up above the breakeven point with Capital One or you will be charged. At Ally, you don’t receive the same grace period but equally you don’t pay as much if an overdraft does occur. Neither Ally nor Capital One imposes account minimums on checking accounts or certificates of deposit. To open a checking account, savings account, or certificate of deposit you are not required to deposit a fixed amount either. Keep in mind that while no minimum account requirements are in place, you will generally earn more interest on savings by depositing more. Whichever bank you choose, Ally or Capital One 360, you can’t go too far wrong. Neither bank will sting you with ongoing monthly checking account nor savings account fees. And account opening and deposit minimums are negligible across the board. However, if are willing to tie up your money for a longer term period then Capital One 360 will be the better choice for you because of its higher CD APY rates. Ally will likely satisfy you more if you plan to store your money in a savings account short-term. For customers who want in-branch support, Capital One 360 has a network of brick-and-mortar locations whereas Ally is 100% online. However, both banks provide around-the-clock customer support for any issues that may crop up. In our Ally vs Capital One 360 comparison, did you spot anything else worth mentioning? Tell us if other factors that stand out to you, we would love to hear from you. >> Ally vs Wells Fargo: Which Is The Better Bank? >> How Much Interest Can You Earn On CDs? ‹ QPlum Review – Wealth Management Powered By A.I.